Hybrid solar device; perovskite LED efficiency; stretchy solar. Researchers at the Lawrence Berkeley National Laboratory developed an artificial photosynthesis solar cell capable of both storing the sun’s energy as hydrogen through water splitting and outputting electricity directly. 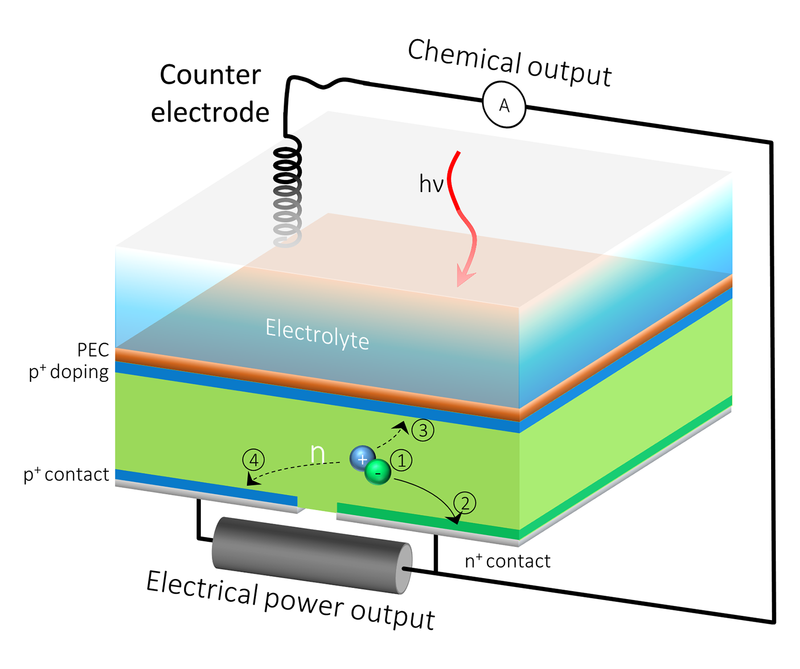 The hybrid photoelectrochemical and voltaic (HPEV) cell gets around a limitation of other water splitting devices that shortchanges silicon’s ability to generate electricity. Typically, these devices are made up of a stack of light-absorbing materials with each layer absorbing different wavelengths. When each layer absorbs light it builds an electrical voltage. These individual voltages combine into one voltage large enough to split water into oxygen and hydrogen fuel. In water-splitting devices, the front surface is usually dedicated to solar fuels production, and the back surface serves as an electrical outlet. To work around the conventional system’s limitations, they added an additional electrical contact to the silicon component’s back surface, resulting in an HPEV device with two contacts in the back instead of just one. The extra back outlet would allow the current to be split into two, so that one part of the current contributes to solar fuels generation, and the rest can be extracted as electrical power. A conventional solar hydrogen generator based on a combination of silicon and bismuth vanadate, a material that is widely studied for solar water splitting, would generate hydrogen at a solar to hydrogen efficiency of 6.8%. The team’s prototype HPEV cells harvest leftover electrons that do not contribute to fuel generation. These residual electrons are instead used to generate electrical power, resulting in a dramatic increase in the overall solar energy conversion efficiency, said Segev. While the same 6.8% of solar energy is still stored as hydrogen fuel, another 13.4% of the solar energy can be converted to electricity. This results in a combined efficiency of 20.2%, three times better than conventional solar hydrogen cells. The researchers plan to continue work on the HPEV concept. Researchers at the University of Cambridge, Chinese Academy of Sciences, University of Sheffield, University of Oxford, and Nanjing Tech University set a new efficiency record of 20.1% for LEDs based on perovskite semiconductors, rivaling the best organic LEDs. The perovskite LEDs can be made more cheaply than OLEDs and can be tuned to emit light across the visible and near-infrared spectra with high color purity. While perovskites are more often known for their use in solar cells, by forming a composite layer of perovskites together with a polymer, they can achieve light-emission efficiencies close to the theoretical efficiency limit of thin-film OLEDs. The perovskite-polymer blend bulk heterostructure used in the LED devices is made of two-dimensional and three-dimensional perovskite components and an insulating polymer. When an ultra-fast laser is shone on the structures, pairs of electric charges that carry energy move from the 2D regions to the 3D regions in a trillionth of a second. Separated charges in the 3D regions then recombine and emit light extremely efficiently. “The best external quantum efficiencies of these devices are higher than 20% at current densities relevant to display applications, setting a new record for perovskite LEDs, which is a similar efficiency value to the best OLEDs on the market today,” said Baodan Zhao of Cambridge. Despite this, perovskite LEDs will need better stability to be used in consumer electronics. While their lifetime has increased from just a few seconds to a current half-life of almost 50 hours, that’s nowhere near long enough to be commercially viable. “Understanding the degradation mechanisms of the LEDs is a key to future improvements,” said Di. Engineers at Rice University developed a flexible, stretchy organic photovoltaic for low but constant power generation. For applications such as incorporation into clothing, organic photovoltaics have better properties than silicon: they can be made thin, lightweight, and semitransparent. However, while typical commercial silicon solar cells reach 22% efficiency, organic solar cells top out at 15%. 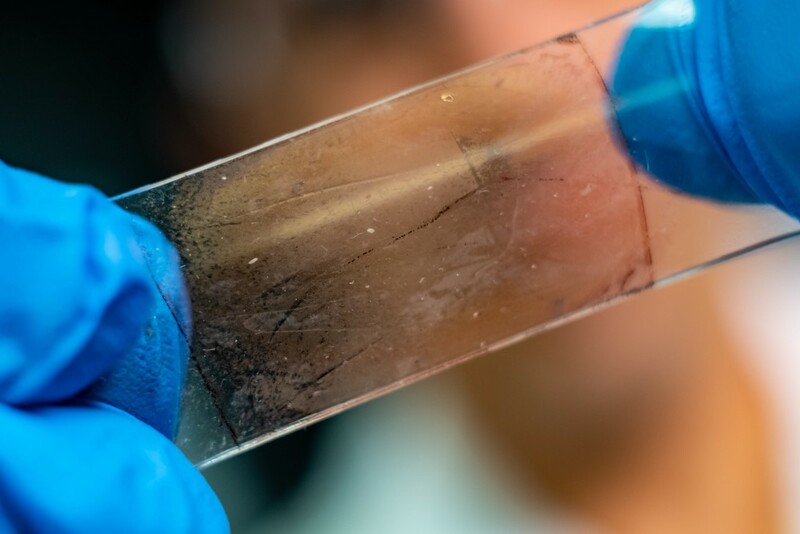 Verduzco said one approach to fixing the brittle problem would be to find polymers or other organic semiconductors that are flexible by nature, but his lab took another tack. “Our idea was to stick with the materials that have been carefully developed over 20 years and that we know work, and find a way to improve their mechanical properties,” he said. To do this, the researchers added in sulfur-based thiol-ene reagents, which blend with the organic polymers and then crosslink with each other to provide flexibility. Finding the right amount was important; too little thiol-ene left the crystalline polymers prone to cracking under stress, while too much dampened the material’s efficiency. When stretched, there was essentially no loss in photocurrent up to about 20% strain, but while the material still flexed at strains over 30%, it became useless as a solar cell.